CHATAN, Japan — These days, when Melissa Tomlinson describes her fraught relationship with the United States, she speaks in English, the language she once rejected. She grew up here on the island of Okinawa. Her mother was Japanese, and her father was an American who served in the Army, came to Okinawa, fell in love, fell out of love, then fell out of touch. Tomlinson’s family tensions illustrate the complex cultural clashes that dominate the politics of Okinawa and, lately, relations between the United States and Japan as they cope with a rising China and a belligerent North Korea. For more than 60 years since the end of World War II, native Okinawans and US troops stationed on nearby bases have developed deep, passionate, and generation-spanning ties that complicate political and diplomatic debates about the future of the US military here. Those passions have recently claimed the head of one Japanese prime minister, Yukio Hatoyama, who had called for the Americans to be booted off Okinawa, and caused his successor to sharply tone down his party’s assertive stance toward the United States. A vocal majority of Okinawans still demand closing the Futenma Marine Corps Air Station. American officials, citing proximity to North Korea, China, and Southeast Asia, insist it remain in Okinawa. Japan, in its attempt to mediate, has only frustrated both sides. The current resolution, which Prime Minister Naoto Kan says his government will honor, calls for Futenma’s eventual relocation to a less populated region in the north of the island. Kan apologized last month for the “heavy burden’’ facing Okinawans. Many residents on this Pacific island hosting more than half of the 47,000 US troops stationed in Japan complain most commonly about the noise, congestion, and crime. But emotional blood ties and cultural confusion amplify those concerns. Tormented by her identity, Tomlinson said she has tried to kill herself “a couple times’’ in the past two years. Tomlinson said she struggles to convince herself — and others — that she is truly Japanese and Okinawan. She called her identity ambiguous and said her feeling of being an incomplete person has sometimes led to deep depression. 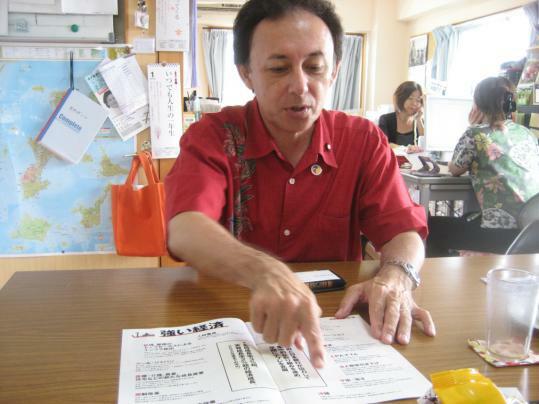 Denny Tamaki, 50, the local representative to the Japanese Parliament, knows only that his father, an American serviceman whom he has never met, was named William. A decade ago he tried to track down his father, with no luck. When his children ask about their grandfather, he tells them that it would take the detectives from “CSI: Miami’’ to find him. Tomlinson’s mother and father were married on Okinawa, and then moved together to Georgia after his tour on the island ended in 1975. Tomlinson was born in Hinesville, Ga., while her father was stationed at Fort Stewart. Tomlinson’s parents separated when she was 3; she returned to Okinawa in 1990 with her mother. Her father retained custody of their two older children, who stayed in the United States with him.